An acquaintance once asked what I thought about urban homesteading. “I mean, come on,” she said. 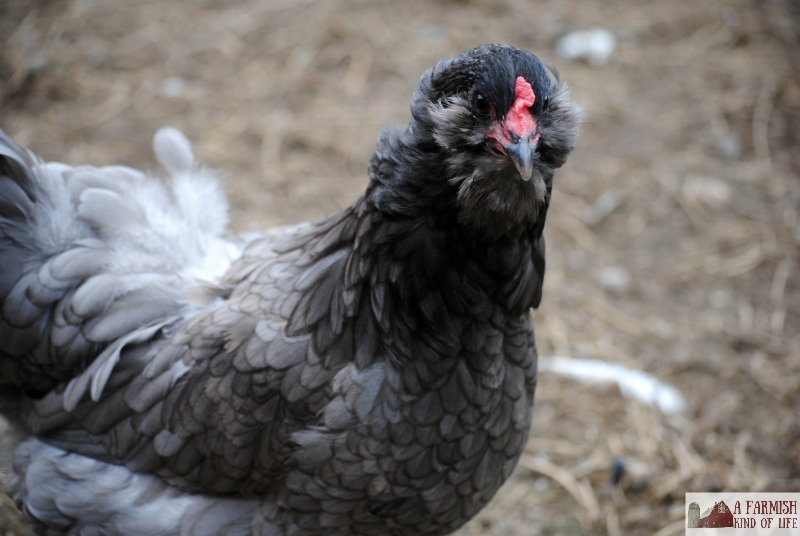 “Urban homesteading?” The term rolled off her tongue with sarcasm and judgement. She’d grown up on a farm—like her parents and grandparents—and then she’d gone and married a farmer. Farm life was in her blood. “Urban homesteading. For real?” The long time farm girl was not convinced. Now, I’m what you’d call a rural homesteader. I live in the country on a dirt road that goes through a river. We own five acres but are surrounded by fields of corn. We’ve got two barns with various animals inside. We also have gardens, grapevines, a raspberry patch, apple trees, and a tiny corn field to call our own. But—plot twist—due to some things I’m involved with, I’ve been spending a lot more time in the city. In the city, there is noise. And traffic. And pavement everywhere. People move along, shoulder to shoulder, blending easily into a crowd. Did I mention there is noise? And so. many. people? Yes. Well, here’s what I think. I think the desire and ability to grow a tomato in the midst of all of that is nothing short of amazing. It’s beautiful. It’s peaceful. It connects you to the ground you stand on. And there isn’t a single reason in the world I can think of that supports the notion that someone growing 40 tomato plants is somehow more awesome than someone who only has room to grow four. In the city, my oldest son commented that the feel of his shoes on pavement all day was “different”. He said his feet actually moved differently on tar than they did on the gravel and grass at home. Notice my son said it was different. He didn’t say worse. He didn’t say bad. He just said different. Things don’t have to be the same to be worthy and valid. Things can be different without being worse or fake or less than or wrong. This is why being able to have 4 chickens is a big deal. This is why containers bursting with pepper plants or basil are important. 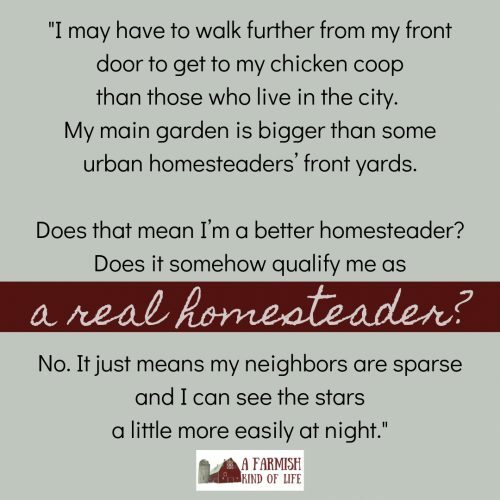 This is why folks in the city can proudly call themselves urban homesteaders—because they are working so hard to do something different than what surrounds them. So while some homesteaders on 40 or 400 acres, living off grid and grinding their own wheat might use the term urban homesteading with air quotes and a sarcasm font, I say no. Growing a pumpkin or raising a few chickens in the midst of pavement and people is something to celebrate. Urban homesteading is real and valid and worthy. Folks in the country don’t get to have some sort of monopoly on baking bread or growing kale or raising chickens or DIY solar projects. The information is there for anyone. The experience is there for the taking—you may just have to tweak it a bit according to how close your neighbors live to you. I may have to walk further from my front door to get to my chicken coop than those who live in the city. My main garden is bigger than some urban homesteaders’ front yards. 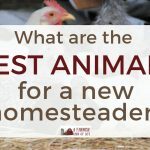 Does that mean I’m a better homesteader? Does it somehow qualify me as a real homesteader? No. It just means my neighbors are sparse and I can see the stars a little more easily at night. And yes, while having more space to work with means I might be able to experience more things or do things on a larger scale, it also (oddly enough) can make me complacent to the fact that I have more space. Urban homesteading means you have limited space to work with, but it also means you learn to use it in amazingly creative ways. Sometimes when you have more space (ahem—rural homesteaders), you are less creative about what you could do with it. And yes, there are people partaking in urban homesteading who can come off as know-it-alls because they read two blog posts about growing snap peas, and somehow they’re now an expert. But, in all honesty, their attitude has nothing to do with where they live. I’ve met know-it-all rural homesteaders, too. Both are equally annoying, and in large doses, could ruin the homesteading community. 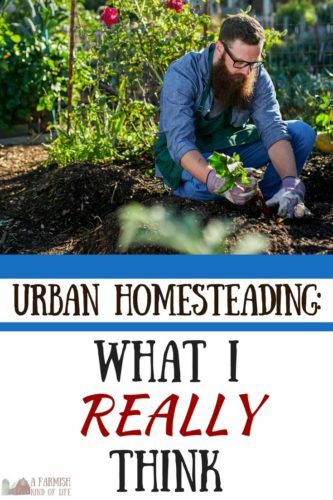 So what do I really think about urban homesteading? I think it’s pretty darn amazing. I think the same thing of rural homesteading, and every kind of homesteading in between. 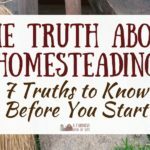 I think homesteading in general is miraculous and that our job as homesteaders is to support and encourage each other regardless of whether we’re surrounded by corn…or pavement. This was a great post. 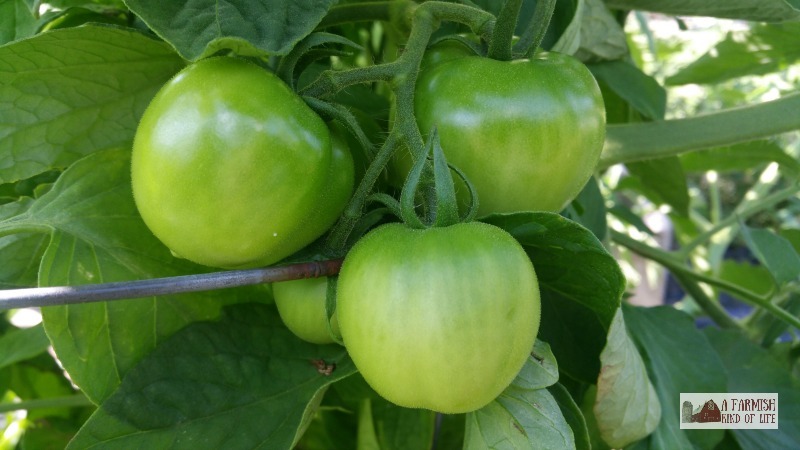 Often as an “urban homesteader” who hopes to move to more rural settings, I often feel like my efforts pale in comparison to rural homesteaders I follow on social media. But then I get to thinking that apart from different settings, we both deal with as many different struggles as we do similar problems. Case in point, I notice a lot of rural homesteaders deal with pests often in their gardens. Living in the middle of Brooklyn, I personally struggle with having any beneficial insects around to help my garden out. We’re all trying to make it and I think in the end that’s what really matters. What a breath of fresh air. It is attitudes like yours that makes me still have faith that the world isn’t going you-know-where in a basket. Thank you for that. As someone living in an apartment, until I can get moved to my land, I agree completely with your assessment that it is just “different”. Carrying bags of soil up three flights of stairs just to get a tomato or two…. makes those tomatoes taste just a bit better. Sure, I’d like to be able to raise the entire salad…but until then, it is just one or two ‘mater plants at a time. Thank you for your judgement-free zone. Appreciated. I grew up on five acres in the middle of farm country in central California. Unfortunately, the land has slowly been developed as housing for commuter families, seeking affordable housing, has boomed. My parents home and land is now huge houses with families rarely home since they must commute back and forth to their jobs in the big city. That’s another story…. We live in an old home in the small town I grew up in and are fortunate to have a large yard and space to grow garden, have a few chickens, rabbits, dogs and whatever else we can sneak into the yard. We once raised a bummer lamb on a bottle in the back yard until he was able to return to the flock. 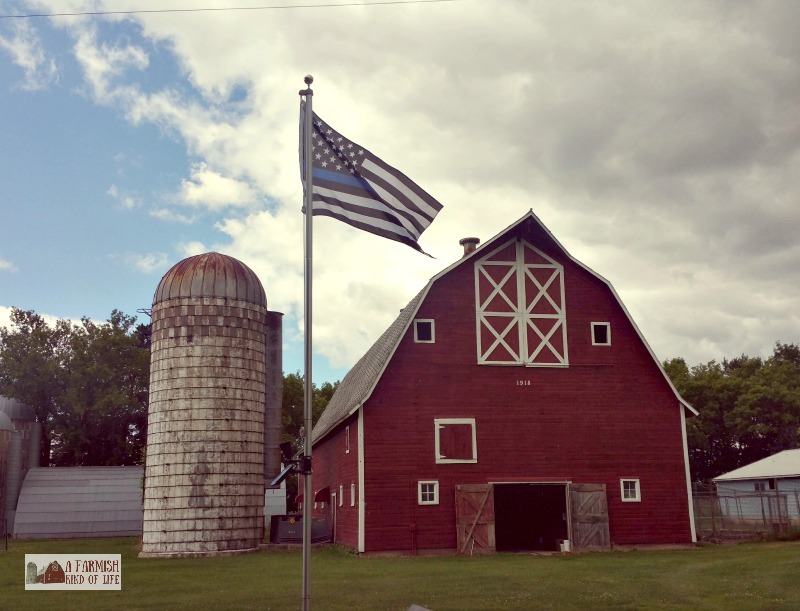 We are fortunate that we still feel a bit of country inside the city. Land in the central valley of California is crazy expensive and although living in the country again would be ideal, it’s not likely to happen for us as we are about to enter our retirement years. So we live, happily, on this little place we call our Urban Farm,. We try to keep our children and grandchildren connected to the earth with growing some of our own food, baking breads, being outside as much as possible, and celebrating simple life of country living in the city. I like this article/story/opinion. I have grown my own veggies some during the past 15 years in a city yard. In plastic buckets and pots when the cats started using the garden for a large litter box. I enjoy it. I do not consider myself a homesteader. I was simply hungry one day and was too tired to go to the store. I do not keep livestock or bees or chickens since the stray dogs and cats would get them. We do get the occasional skunk and opossum wandering through. That makes it feel more like a farm. Just my thoughts. Your son was right when he said it only feels different. My sister has a farm out in the country and we both talk about canning and preserving fruits and tomatoes. Another sister lives in a suburban area and she also makes jam and other preserves. So we are all not that different.